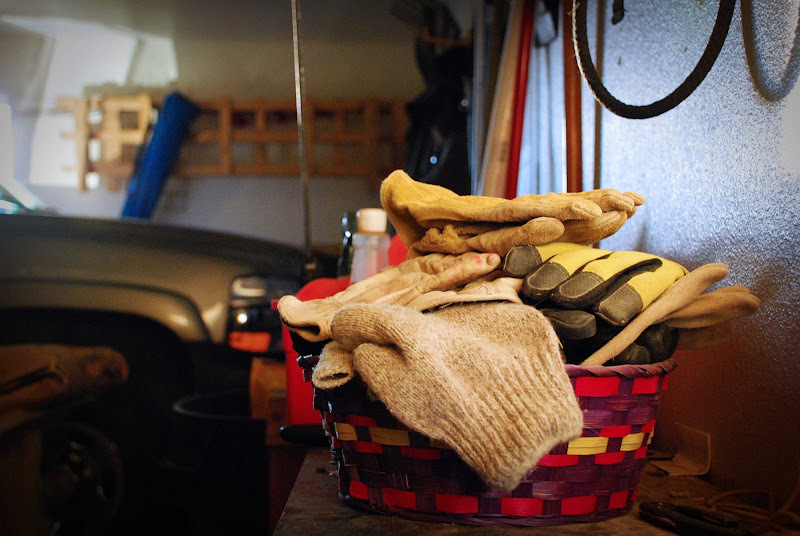 A basket of gloves sits next to the door leading out to the barn, and all the ranch hands can grab a pair on their way out. There must be a lot of ranch hands working here 'cause there sure are alot of gloves. 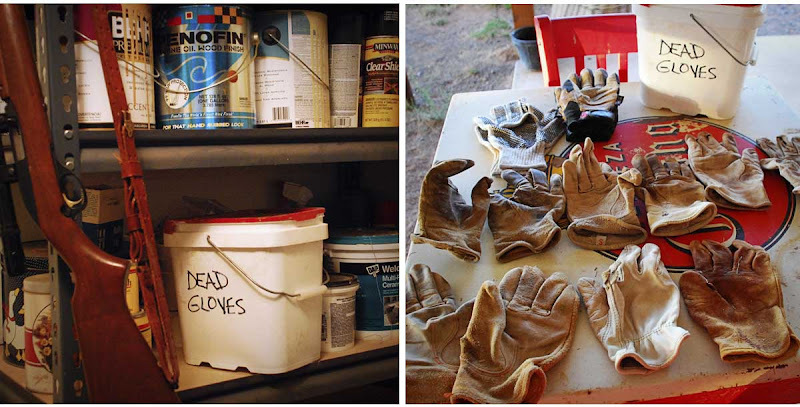 Actually there's just one ranch hand with a glove fetish, and I can't bring myself to throw them away when they wear out. 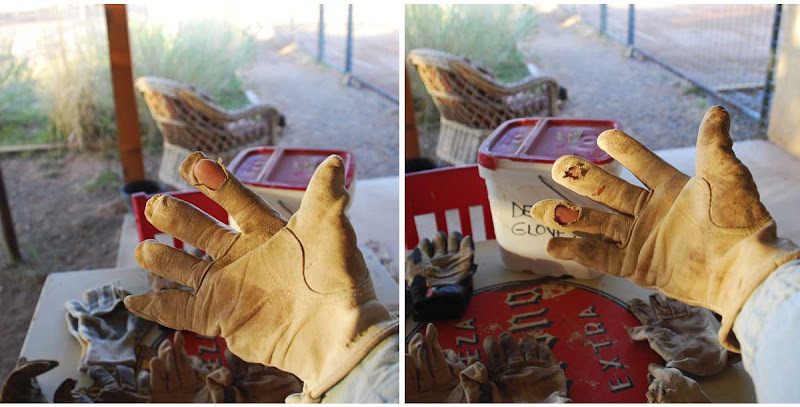 You never know when an old, expired glove might come in handy. I stash them away in the event 20 ranch hands all show up at the same time and need a pair. Generally, the dead left glove in every pair is in better shape than the right, seeing as how I'm right-handed. And each pair wears out a little differently, depending on the season when they were in use. Now take this glove on the left. The wear pattern was caused by moving two-string hay bales...lots of them. I'll bet I wore this pair last summer. Ahhh, the bittersweet memories of chores gone by. The glove on the right? I can say with certainty that it was worn in February 2006, the month I got Smooch and she was in her chewing period. Call me nostalgic, but I just can't part with these handfuls of my past. And not every glove is created equal – some have very unique features for well-defined purposes, like taking pictures in the winter. Why, there are so many gloves for so many purposes out here, if you lined them all up, they'd stretch for miles...or at least out to the end of the porch. No, I won't be getting rid of any of my gloves any time soon. They're a part of me now, milestones of the past 16 years, remnants of fences stretched, trees felled, and poop scooped. So why all the reminiscing today? Because April 19th marks the sixteenth anniversary of the day I jumped off the corporate ladder, clicked the heels of my ruby slippers, and landed in New Mexico wearing a pair of red lizard cowgirl boots. Smooch can't believe I wore those things either. Congrats on your 16 years and I'm sure you've never looked back. I love our life here in KS. Happy Anniversary Dorothy!!! Nice to hear you're enjoying living in the land of OZ! Now that's some gloves. Happy anniversary! I'm sure you haven't regretted it since! I am counting the years until we retire! Oh! You know how much I admire you for taking that leap! I look to you and others like you and say, Yes! it can be done. I have one ratty old pair of gloves in my car for rainy days. Literally. The leather gets all soppy and stretched and the gloves get ruined really quicky. But it's my brand new gloves that I love. Unlike you, I can't wait to ditch the old ones. P.S. Seriously...? You wore those sparkly Dorothy heels? Yes, that sure is alot of gloves! I can be that way about things too, even though its worn out, gotta keep it just in case! Too funny! We have quite a few of those same gloves sitting around here! I like the shot of them all lined up. I had to laugh over your line of gloves, and some of the stories behind them! You know though, you just might run across a left-handed person some day with whom you could swap gloves and you'd both be tickled to death!! 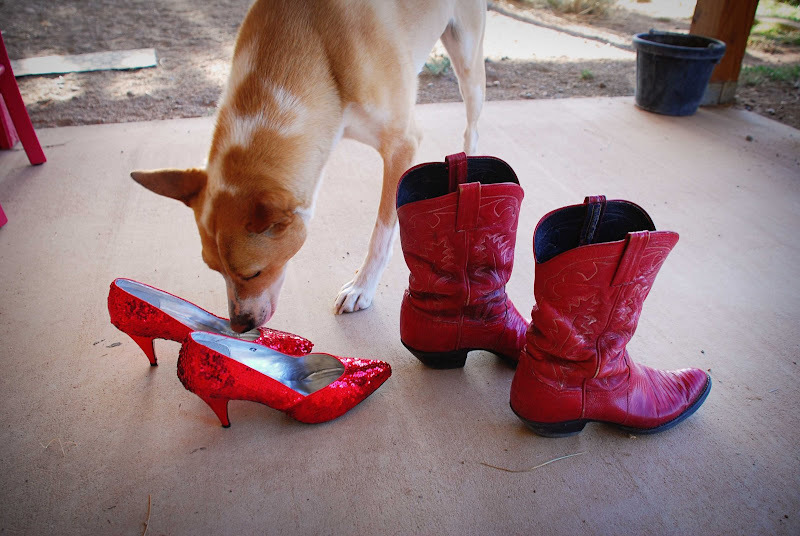 As for the ruby red slippers ... yes, I know what Smooch thinkin', "WHAT in the world!?!?!" I haven't been around horses long enough to wear out my gloves yet....well, not entirely true, my favorite Ariats are getting a tiny hole in one finger! :( I like the idea of saving them though! I wear gloves all the time, even just for grooming, even in the summer. Big Congrats on your anniversary of your "escape"!! 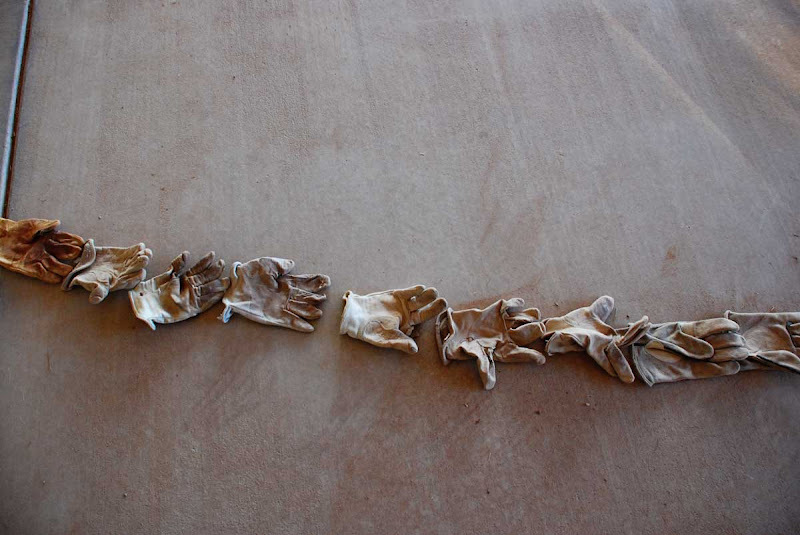 Love the Trail of Gloves (Another Trail of Tears?) Sadly our extras don't last long with two terriers. Unlike Smooch, they don't have a chewing phase. 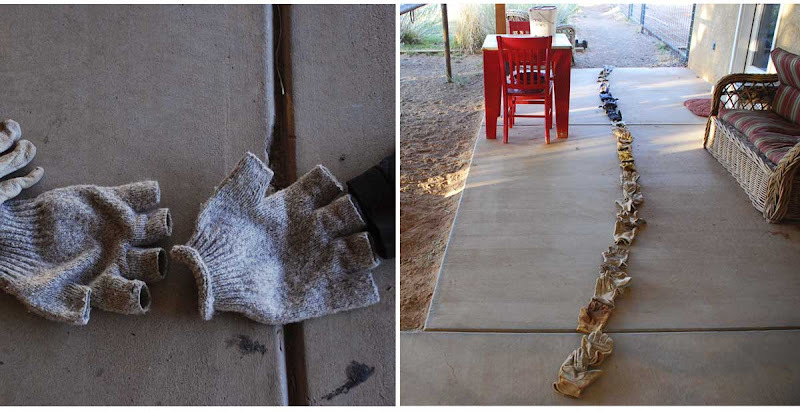 I walked out this morning to find a gardening hat and three pair of underwear strewn in front of the barn door. All well chewed. Love the photo with the red shoes, boots, and Smooch. I'm glad to see the "you might like these stories" section--I was hoping you would add something like this to the new layout, because I was missing the changing features you had up on the top left of the old layout, where you had links to themes within the blog like "ever wonder about the person writing this blog?" "I stash them away in the event 20 ranch hands all show up at the same time and need a pair." hey dreams are everything!!! Hang on to that one!!! And can I just say that you trail of gloves is too funny??? I have that problem with socks at my house. Congratulations on your 16th Birthday and to the life you had the courage to take in both (ungloved) hands! Congratulations on the anniversary of your jump off the corporate ladder. I'm trying to figure out how to do it myself, so you might say, YOU are my hero. Seriously, Carolynn. Wore them once for about eight hours, to an inaugural ball in 1993. Can't remember what I did with the matching dress, but I can't part with the shoes. Pat, what a brilliant idea. Now all I have to find is a left-handed person who wears size small gloves. Your post is inspiring; I'm working on wearing out my first pair of barn gloves. The line of gloves scares me a little though. Reminds me of a campy horror movie I saw where severed hands were "walking" around. Congratulations on your anniversary. I like those heels but at this stage of the game, don't think I could walk in that kind of show anymore. I'd save them too, just to have them. Love your gloves, we have many mismatched pairs like that with plenty of wear and tear to go around. This is a very timely post for me. My beloved pair of gloves that I got last September now have a giant hole in the ring finger of the right hand. I was thinking, "I should throw these out." Then I was thinking, "But the left one is still perfectly good, so what do I do?" I find that water is the biggest enemy to gloves, and because I hold the hose in my right hand, the right glove develops holes first. Congrats on your 16th anniversary! 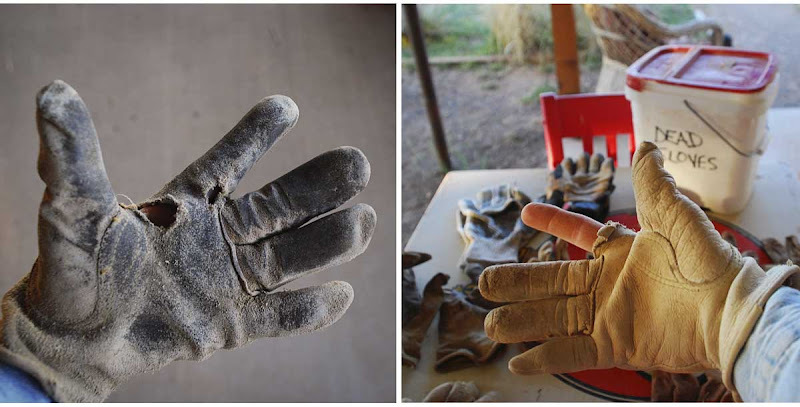 And I also have a problem with throwing gloves away that look a lot like yours...only mine are worn from yard work...wish I could say... it was from working on the ranch. Wow, 16 years...I bet it doesn't feel like that long! Way to go! I have a basket of gloves just like this on the shelf in our main hallway. So dang GLAD you jumped off that ladder and are doing what you are now! Congratulations on a GREAT choice. Yeehaw! This is my house! I have gloves like that too.....some are pair-less, some don't have fingers, some have nasty tears in them that make me wonder how my fingers survived. But yes, ONLY the lost gloves aren't being kept. And I give them a place of honor...by the back door in the bottom of my china hutch! Geesh, I am silly. You have way too much time on your hands- no; wait, that's way too many gloves for your hands! Congratulations on 16 years since the best decision in youur life! Now I understand... :) Thanks for a wonderful day at 7MSN Linda. We loved every minute of it.